Poinsettias are the quintessential festive houseplant! And with Christmas now just 10 days away, this is December's Houseplant of the Month. 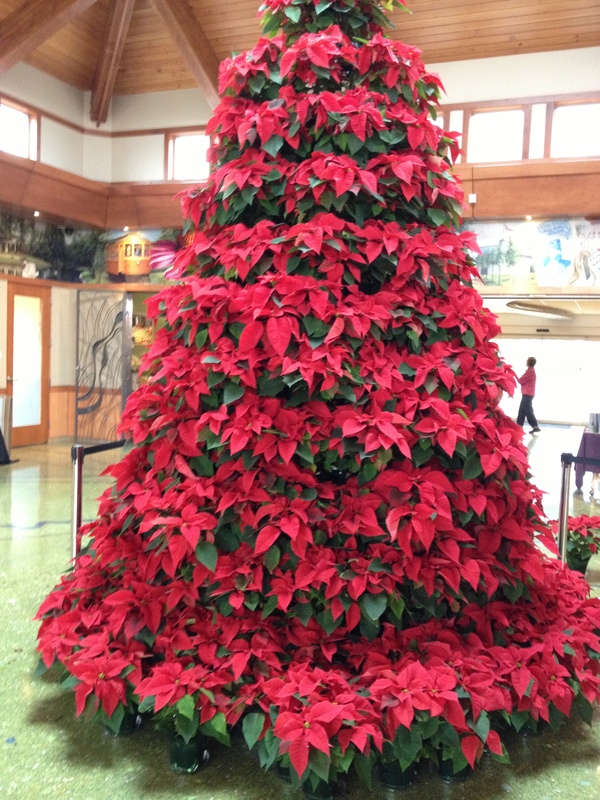 Grab a poinsettia from your favorite garden center and enjoy! The traditional scarlet red variety may be the first to come to mind, but did you know that they also come in white, cream, pink, apricot and bi-coloured? The Latin name for poinsettias is Euphorbia pulcherrima, which means the most beautiful of all Euphorbias. Poinsettias are part of the Euphorbiaceae or Spurge family. Many plants in the Euphorbiaceae family ooze a milky sap. Some people with latex allergies have had a skin reaction (most likely to the sap) after touching the leaves. The plant originates from Central and South America. In its home country of Mexico, where the poinsettia is called 'La Flor de Noche Buena', the Christmas Eve Flower, it has been directly associated with Christmas since the 16th century. The poinsettia is named after Joel Roberts Poinsett, the first United States Ambassador to Mexico, who introduced the plant into the US in 1828. And there is a Poinsettia Day on December 12thin honour of Mr Poinsett. The colourful bracts (modified leaves) of the poinsettia, which are arranged in a star-like circle, are often mistakenly believed to be flowers. The actual flowers themselves though are yellow and quite small. They can be found at the center of the bracts. Usually, available from October to January, the poinsettia is known as the 'Christmas Star' in some European countries, such as Germany, Holland and Italy. What many people do not know is that poinsettias also look great as cut flowers in a vase. Briefly dip the cut stem in boiling water. This treatment prevents the milky fluid from seeping out of the stem and also prevents wilting. The flowers will then last for about two weeks. For pets, the poinsettia sap may cause mild irritation or nausea. Probably best to keep pets away from the plant, especially puppies and kittens. Learn more about Poinsettias on our The Poinsettia Pages website. Like this blog post? Sign up to get our posts delivered to your inbox below.